The final step in the decision-making process is to implement the decision. To implement your decision you must act on it, keep yourself on track, and determine how well you’ve done. These stages we call Action, Affirmation and Assessment (the three As). The symbol we use for implementing the decision is an arrow returning to its course. 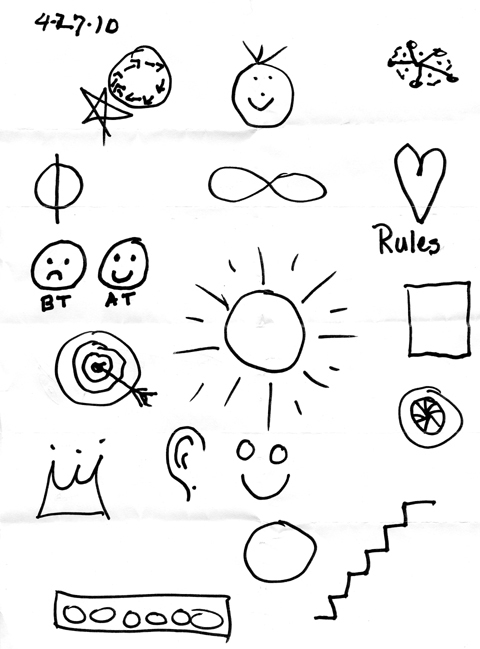 All six symbols for the 6 steps serve as reminders to students of the tasks at hand. During the final group session, however, everyone gets to sign into a group symbol to personalize the entire program in a special way. See posting to the right. Significantly, PERT –Programmed Evaluation and Review—techniques, are also taught in step six. Something as simple as pocket calendar is a proven PERT tool. Each client explains his posting to the rest of the class. Even the most bashful prisoner receives a round of cheers and applause for his contribution. In addition to PERT and symbols, many behavior changing motivational programs employ rituals as concrete reminders of the new habits that must be recalled and exercised. We discuss and elicit suggestions for rituals that might be useful upon re-entry. One of the most obvious and oft mentioned is to walk away from the street corner that got you into trouble to begin with. An inmate, who had acknowledged how experienced he was in different incarcerations for several years, noted that the Thresholds program was very unique. He pointed out that while all the other programs, such as drug and alcohol rehab, anger management, etc. , involved instructors talking at or to a group of people Thresholds was the only program that offered one-on one meetings, and the only program that asked the audience to share or participate in the discussions, whether in one-one-one meetings or the group gatherings.